People and dogs have coexisted and worked in unison for thousands of years across North America and Siberia. The oldest archeological evidence suggests that humans started using dogs as an integral part of their nomadic lifestyle as long ago as 14,000 years, in their migration across the Bering Land Bridge. The essential relationship to an animal counterpart that is arguably engrained in our genetics helped establish human habitation in the north, including Alaska. It wasn’t until recently that humans no longer depended on their canine partners for travel. In an understandable drive to travel farther faster, wheeled, tracked, and winged machines started outnumbering sled dogs in the Alaskan villages in the 1960s. But it wasn’t just the sled dogs that disappeared. Rapid “progress” brought an outside values system that impacted traditional skills and livelihoods in the villages. Children, especially, felt an overwhelming lack of identity. This in combination with other complex factors, escalated suicide rates as well as drug and alcohol abuse that now deeply impact Alaska Natives. George Attla was at the height of his mushing career when this photo was taken in 1978 with one of his lead dogs at his North Pole kennel. He was known for his strong connection to his dogs, and always said that dogs never make mistakes—it is always the musher. 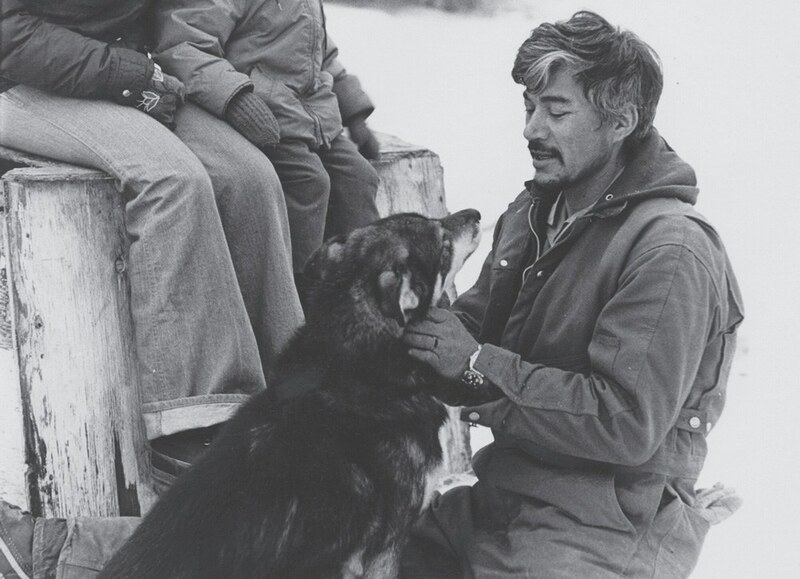 Legendary dog man and musher, the late George Attla would likely say the solution is to bring sled dogs back to the communities of the Interior, and to not only reintegrate them back into daily life, but they may be so important that dog care and mushing should be incorporated in school curriculum. Attla dedicated the final years of his life to strengthening young people physically and mentally, and deepening cultural pride across all generations, through a shared vision to revive dog mushing and all of the lessons the sport had to offer. With the help of his partner, Kathy Turco, this vision expanded to A-CHILL, The Alaska Care and Husbandry Instruction for Lifelong Living project, a thriving school curriculum that integrates sled dogs into classrooms throughout two different school districts. As a child, George was nomadic with the rest of his family, moving seasonally from camp to camp. However, at age eight, he was sent to the hospital in Sitka to be treated for tuberculosis. Here he was provided the white and western perspective of education. Nine years later on his return, he started to see that villages had also assimilated western education in schools without acknowledging the social, educational, and values systems of Native culture. George Attla in 2014 at 80 years old at the Huslia New Years youth races. Attla believed dogs teach youth life lessons in a race, including preparing for it. The youth in the photos were all part of the Frank Attla Youth and Sled Dog Care-Mushing Program, which was started and run by village volunteers, including dog mushers and their dogs. Youth dog handlers are considered just as important as the racer—it is the pride of all to bring a racer to the line. After a professional sled dog racing career, George faced the unexpected death of his son. While grieving, he was inspired to start a sled dog care, culture, and mushing program in Huslia. George and Kathy started seeking support from volunteers and private companies to help launch the pilot Frank Attla Youth and Sled Dog program, instituted at Jimmy Huntington School. Partnered with the teachers and volunteers from the community, they instituted traditional practice into mathematics, history, biology, and literature. Dog care and culture were studied through field trips to dog yards twice a week where students learned from some of the greatest mushers and dog men of Alaska. “It takes a tribe to raise a child,” Amanda said. “To provide for a dog team, the community has to be involved. You have to hunt and fish together, as a tribe, as a people. That is one of my favorite parts to this.” George Attla passed away in 2015 from bone cancer, but his legacy continues. Kathy wrote every aspect of the Frank Attla Youth and Sled Dog program into a manual and distributed it widely. The result was the A-CHILL community-based project, funded with a grant from the U.S. Department of Indian Education serving the Alaska Gateway School District and the Yukon-Koyukuk School District, which include the villages of Dot Lake, Tanacross, Tok, Mentasta, Northway, Tetlin, Eagle, Allakaket, Hughes, Huslia, Ruby, Koyukuk, Nulato, Kaltag, Manley Hot Springs, Minto, and Rampart. Jayme Dittmar is an outdoors enthusiast, journalist, and visual storyteller based in Alaska. She has been mushing, packrafting, and traveling in the villages of the Interior for the last five years while directing her work to protect northern lands and livelihoods.